This book was first published in 1987. School phobia (or school refusal) is a puzzling problem that is still insufficiently understood. It is quite different from truancy and can lead to long-term adjustment difficulties if ignored or inappropriately treated. 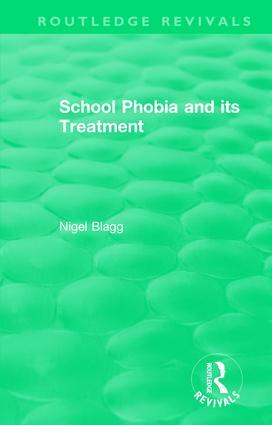 The purpose of this book is three-fold: first, to describe the nature of school phobia; secondly, to review the treatment literature exposing the common elements of the most successful, though theoretically different, approaches; thirdly, to provide a detailed step-by-step guide to the diagnosis and treatment of school phobia involving a rapid return to school and comprehensive behavioural management. The techniques and principles discussed are illustrated in a series of case studies. The book is aimed at parents and those professionals who regularly come into contact with children with school phobia, such as educational and clinical psychologists, child psychotherapists, behaviour therapists and family therapists, psychiatrists, paediatricians and family doctors, and teachers and researchers from all phases of education. If these professional groups could achieve a common understanding of school phobia, many more children could be treated quickly and effectively. Part I: The Nature and Treatment of School Phobia: A Critical Review of the Literature. 1. The Nature of School Phobia. 2. Psychodynamic Approaches to the Treatment of School Phobia. 3. Behavioural Approaches to the Treatment of School Phobia. 4. A Comparison of Behavioural and Psychodynamic Approaches. 5. Treatment Approaches: Summary and Conclusions. Part II: The Rapid Treatment Approach to School Phobia. 6. Diagnostic Considerations. 7. Treatment and Resistance to Treatment. 8. Case Studies. Appendix: School Phobia Record Form.